Set in the foothills of the Sperrin Mountains, Strabane Golf Club is a rolling parkland course intersected by the River Mourne. 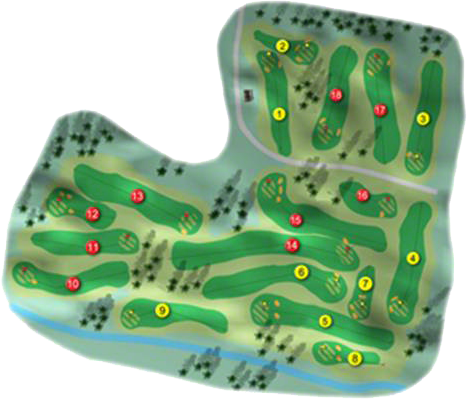 Designed by Desmond Hackett it is a par 69 measuring 5,628 metres with a standard scratch of 69 off the blue tees. The water first comes into play at the index 3 328 metres 9th known as "The River" with a demanding tee shot the golfer is then faced with a medium iron to a narrow sloping green. The river runs all the way up the left-hand side awaiting any wayward shots. 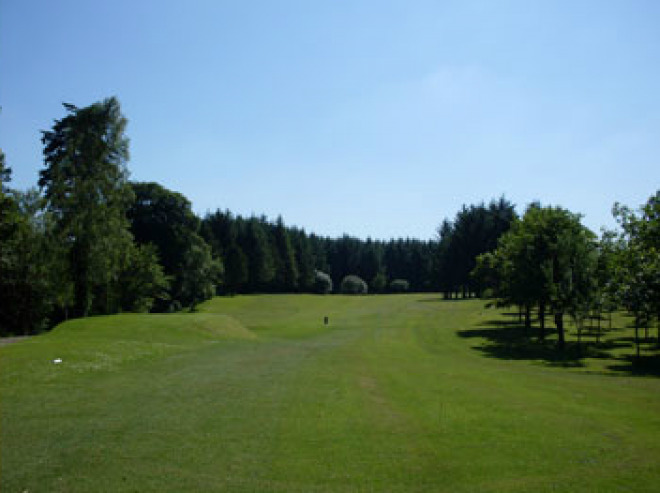 There are many fine testing holes to be found at Strabane Golf Club it is regarded by professionals and low handicap golfers as an excellent test of golf. Strabane Golf Club won the Ulster Final of the Irish Mixed Foursomes when they beat Mahee Island Golf Club by 3-matches to 2-matches on Friday 19th August 2016. They were drawn against Connaught Champions Gort Golf Club at Shandon Park Golf Club on Friday 2nd September in the All-Ireland Semi-Final and lost out by 3½-matches to 1½-matches to the East Galway side. They were led out by C. Patton with H. Mitchell who lost their match against K. Mulkerrins with E. McSweeney by 1-hole they were followed by C. Sharkey with B O'Kane who had a 2and 1 win over G. Broderick with S. Broderick next on the tee was P. McCrossan with L, Patton who lost their match by 2-holes against J. Leahy with J. Collins in the penultimate match D. Devine with L Patton had another close result when they lost by the minimum 1-hole against P. Curtis with T. Gill the bottom match of P. Doherty with L. Duffy against N. O'Shaughnessy with J. Joyce was recorded as a halve. Strabane Golf Club won the Ulster Final of the Jimmy Bruen Shield in 2014, when they beat Faughan Valley Golf Club by 3-matches to 2-matches in the Ulster Semi-Final and Galgorm Castle Golf Club by a similar margin in the decider. They made their way to Carton House to compete in the All-Ireland deciders on the O’Meara Course where they were drawn against Leinster Champions Waterford Golf Club in the All-Ireland Semi-Final. They were led out by Conor McCool with Liam Curry who lost their match against Gary Dunphy with Pat Murphy by 1-hole, they were followed by Frankie Gallagher with Andrew Connolly who lost their match by 2-holes against Paul Mackey with John Hale, next up were Kevin Connolly with Declan Devine who went down to John Phelan with Michael Wall by 3 and 1, in the penultimate match Damian McGranaghan with Shay Callaghan had a 3 and 2 win over Barry Griffin with Chris Hoban and in the bottom match Gary Duffy with Ciaran Duffy recorded a 4 and 3 win over Matt Holohan with Eamonn Rice, alas to little to late. Helen Jones added the 2012 Irish Close Championship to her victory in the Irish Seniors Open Championship she won in 2010. She had a 4 and 2 win over Violet McBride of Belvoir Park at Bunclody Golf & Fishing Club on Thursday 5th July. Irish Senior International Helen Jones was crowned Irish Senior Women’s Open Strokeplay Champion following a 6 stroke victory over Lynda Palahniuk from Canada at Laytown and Bettystown Golf Club, on the 10th September 2010, she shot rounds of 74, 78 and 76 for a total of 228. Strabane Golf Club won the Ulster Final of the Irish Mixed Foursomes in 2009 and made the long journey to Bandon Golf Club, where they met Leinster Champions Mullingar Golf Club in the All-Ireland Semi-Final. First on the tee was Aidan Boyle with Ann Duffy who had a convincing 5 and 4 win over Paddy Dunne with Ann Hannon. They were followed by Enda Kennedy with Angela Houston who also recorded a 3 and 2 win over the team from the Midlands represented by Aiden Tomkins with Bernie Kelly. Next up was Darren Crawford with Caroline Connolly who lost out to Gerry Purcell & Ann-Marie Conlon by 2 and 1. The penultimate match of Martin Roarty with Mary McCrory against Frank McGinty with Brege McCarrick also went to the team from Mullingar by 2 and 1, the place in the All-Ireland Final now hung on the bottom match of Conal Cooke with Bernie O’Kane against Bernard McDonnell with Jeannette McDonnell went 4 and 2 to the Mullingar pair who went on to play Portumna in the All-Ireland Final of which the Galway team recorded a convincing 4 matches to 1 match victory and their first green-pennant. Helen Jones was selected on the Irish Ladies team for the Home Internationals played at Royal Porthcawl from 8th to 10th September 2004. Helen was selected on the Ulster ILGU Team for the Interprovincial's. Played at Ballybunion Golf Club from 18th to 20th August 2004. Helen Jones was selected on the Ulster Ladies' team for the AIB Interprovincial Championships at Mount Wolseley Golf Club from August 7-9 2002. She had played at The Island Golf Club from the 8th to the 10th August 2001. Strabane won the Irish Club Youths' Team Championship at Thurles G. C. in 1991, when the team was Seamus McGranaghan, Darren Crawford, John Callan and Sean Devenney. Strabane Golf Club won the Ulster Junior Cup in 1988, when the team was Tom Mulholland, Pat Curry, Darren Crawford, Enda Kennedy, Liam Curry and Charlie Patton, they were captained by Oliver McNeill. They won the Bulmers Ulster Junior Cup again in 1991, when the team was F. Patterson, C. Patton, N. Callan, L. Curry, Sean Devenney, J. Callan, N. Wolfe, P. Corry and R. Harte. They won Ulster Irish Junior Foursomes in 1990, when the team was R. White, Sean Devenney, S. McGranaghan, K. McCool and J. Callan. They won the Ulster Jimmy Bruen Shield in 1984, when the Team was Sam Stirling, John O’Donnell, Frank Friel, Maurice Crotty, Danny McGinley, Garvan Godfrey, Declan McDonnell, Jim Roarty, Francis Devine, Francis McKee, Joe Curry, Danny Duffy, Jim Patton, Pat Patton and Oliver McNeill. They won the Donegal Inter-Club League in 1990, when the team was Willie Christy, Bernard McCafferty, Charlie Patton, Brian Patton, Liam Curry, James McGranaghan, Jim O’Donnell, Pat Steenson, Eamon McPhilemy, George Hunter, Angus Callaghan, Jimmy Roarty. The Ladies won the Tyrone and Fermanagh Trophy in 1999 and the North West League in 1997. "Irish Life" on the 6th of December 1912 carries the following record on this club "This club (founded in 1909 by Mr. L. J. Passmore), originally had its course close to the town of Strabane, and was a winter course only. In November last year (i.e. 1911), it had the good fortune to secure 35 acres of very suitable land at Carricklee one mile from Strabane, the property of Mr. E. C. Herdman, D. L., whose friendly interest has in no small degree been responsible for the clubs present successful position. Play is now possible throughout the year. Mr. L. J. Passmore, the founder, is Hon. Secretary and well fits the position being the leading player in the club" The first Captain was W. B. Smyth, and it had 150 members including ladies, and the holes varied in length from 305 yards to 120 yards and measured 2,400 yards in total. The club went eighteen-hole in 1974 having moved to its present location at Ballycolman in 1953. Woodrow Wilson, former President of the United States whose family came from Strabane, once described golf as "a game in which one endeavours to control a ball with implements ill-adapted for the purpose". Golf in Strabane is 100 years old this week (14 December 2008). In the year 1908 Strabane was a market town of 5,000 people, with a rail service to Derry, Letterkenny, Donegal and Dublin. The Town Hall had recently been re-styled at a cost of £2,000. Markets were held monthly, fairs were held four times per year, and twice a year for hiring labour. That year the Steamboat Company announced profit on trading on the canal. A new Technical College had opened at Upper Main Street and a new parochial school had been erected by the Duke of Abercorn in Bowling Green.